The Keltek Brewery in Redruth has teamed up with London-based ‘edible architectural wizards’ Bompas & Parr to produce 1000 limited edition bottles of exclusive Courvoisier punch. 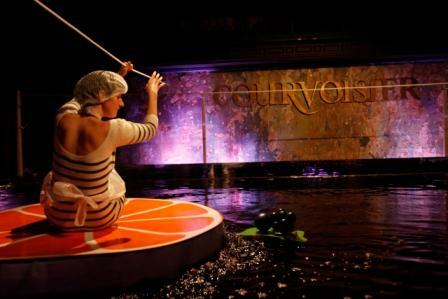 In 2009, Bompas & Parr worked with the well-known Cognac brand Courvoisier to produce ‘The Architectural Punch Bowl’ – A punch bowl so large that it could serve 25,000 people, and you could boat across it! A competition was held to decide the recipe of punch that would fill this unique project, and ‘The Emperor’s Shrub’ – a cocktail containing Courvoisier Exclusif, berries, organic cider vinegar, and winter spices – came out on top. To add to the novelty of this revolutionary exhibition, another competition was held after the event with winners able to claim themselves one of only 1000 limited edition bottles of the punch. Bompas & Parr contacted the Keltek Brewery in Redruth for help in producing the bottles, and less than ten days later the prizes were on their way up to London to await the lucky winners. Money raised from the event was donated to Article 25, a charity that gives architectural and building advice to aid agencies and NGOs in disaster situations.